Once again, the art trail will come with a preview exhibition in Chichester’s Oxmarket Gallery. The 2019 trail will offer 160 artists exhibiting a wide range of work across 127 venues in and around the city of Chichester during the first two weekends in May (Saturday, Sunday, Monday, May 4, 5, 6; Saturday, Sunday, May 11, 12, 10.30am-5.30pm). Kicking it all off will be the preview exhibition at the Oxmarket, running from Tuesday, April 23-Sunday, April 28, a taster event showing work by each artist to help visitors chose which venues to visit. 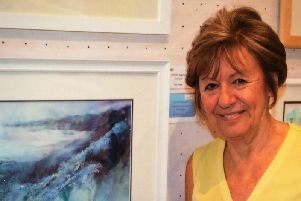 Art trail chairman Nicola Hancock said: “Chichester Open Studios Art Trail is a now traditional fixture held throughout our local area during the first two weekends in May. It is an unparalleled opportunity for artists to present their artwork in the inspiring context of their working environment, to large numbers of interested and purchasing visitors. “Our widespread artists are divided into the City, Downs, Harbour, Peninsula and Regis Trails. Visitors can explore one trail at a time or hop around venues as they choose. This is the chance to enjoy the art and hospitality of our talented local artists. The trail guide, with its maps showing venue locations, directions, and a profile of each artist, helps visitors to plan their own route. Guides are available from The Oxmarket and other central locations, from April. “Chichester’s Open Studios Trail is an experience in itself. Visitors love to gain an insight into an artist’s working practice and making the associations that bring the work to life. With work as varied and individual as each creator, there is something to suit every taste and visitors will have the opportunity to acquire original works of art. There may be demonstrations, a chance to have a go, or information about artists’ events or courses. “Some venues offer a cuppa and cake to add to the enjoyment of your experience. Everyone is welcome and admission to all venues is free. Visit www.chichesterarttrail.com for more information about the art trail.